Pros: This was a great tv... Thin Low power. Bright. Spearks could be better but they are fine for the bedroom. anyone that thought they would be any better was a fool to start with. Other Thoughts: Edge lit LED but does it really matter for a bedroom tv. Pros: Easy setup. Great picture quality. Cons: Be sure to purchase a good set of speakers with it. The sound quality is that of a 50 year old transistor radio. Pros: Sound is good - inputs and outputs are plentiful - price was great. I would have given 3 eggs but as always I had to add one because of their SUPERIOR customer service. Cons: Picture quality just not great. Its not poor just a little blurry but for price it would have been acceptable to me. Other Thoughts: I bought this as gift and recipient was not happy with picture sharpness (just a bit blurry) so I bought another tv from Newegg (32 inch Auria for a yet another great price) and I personally viewed them side by side and I had to agree on the sharpness of picture issue. But as always Newegg customer service was OUTSTANDING and they processed my return and issued refund promptly. Other Thoughts: Overall, was upset my first HDTV ever had a busted pixel, but after returning it I was happy. Very low price and amazing picture quality. The sound is decent too via HDMI on my 360, no need for external speakers. Satellite sound isn't so great compared to my SDTV though. Looks great next to my two 20" LCD computer monitors. I'd recommend this TV to others. Other Thoughts: Be advised the extended warranty is comical to say the least.. be sure and read it and you will find just about every disclaimer to not cover your product under the sun. it sounds good till you read the fine print. Just a heads up. Cons: Extremely bright. The top bottom and sides throw way too much brightness that cant be adjusted out..
Other Thoughts: Have another different brand from newegg coming since I returned this. I do own other products from sceptre and am happy with them but they completley dropped the ball on this one..
Pros: Cheap and easy to use. Picks up local digital channels. The picture looks great with HD channels and with my ps3. Very thin and sleek. Cons: Sound isn't great. However it has a headphone jack so I just plugged in a pair of $20 computer speakers and it sounds good. Inputs are a little hard to reach. Pros: Price and thin profile. Got it as a cyber monday deal, hard to turn down a <$200 LED LCD 24" tv. Very thin profile, pretty good looking bezel. Cons: I got the tv to use as a preview monitor for Final Cut Pro - figured the LED backlighting would make it a better quality image than a straight LCD, and was totally wrong. The edge backlighting comes from the top and bottom of the screen and is very bright and uneven, particularly when viewing a dark scene, without any way to adjust or disable the backlighting, you're kind of stuck with it. Picture also seemed very harsh and it only improved when i brought the sharpness all the way down. Other Thoughts: The perception that LED-LCDs are superior to LCDs isn't always true. Direct backlighting is obviously preferable to Edge backlighting, it seems like they have a lot of bugs to iron out before its consistently better than LCD. 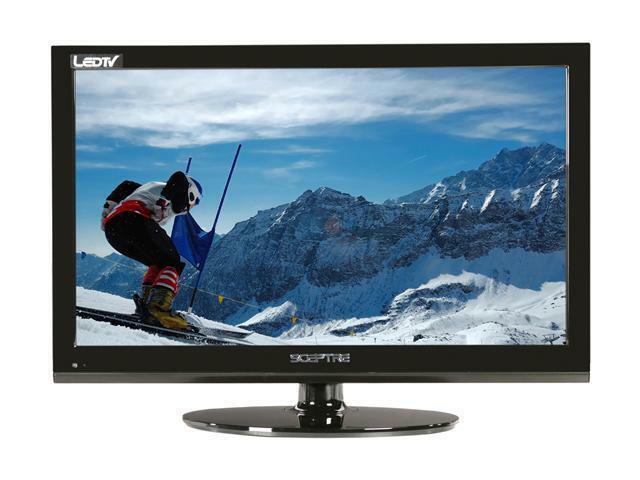 Going with a slightly more expensive 24" LCD Viewsonic TV instead, i feel the extra $75 or so will be well worth it.